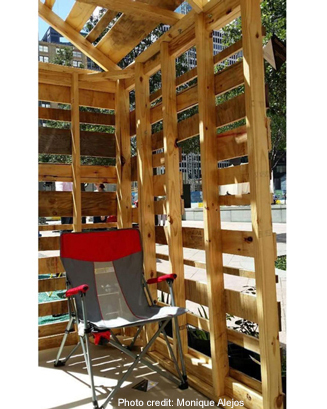 This past September Vladimir and I participated with a group of fellow young professionals to build a “Tiny House” for the global event called Park(ing) Day. 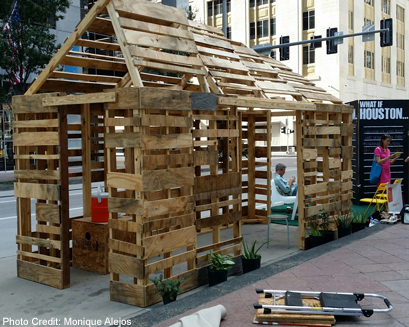 Occurring annually on the third Friday in September, Park(ing) Day encourages people from all fields to collaborate to transform a city parking space into a temporary public space or park. The goal is to contemplate how the space could be used in lieu of an immobile, parked car and to promote the discussion on ways people, urban planners, and cities think about the use of public transportation, potentially changing the work environment for the better. Our ‘Tiny House’ concept started off as a random email string discussing what to do with leftover materials from a previous Rice Design Alliance event when someone threw out the joke to build a tiny house (!!) since they were all the rage in 2015. This joke quickly formed into a serious option and developed even more as it was suggested for the Park(ing) Day event. With our idea shaping into a true concept, a small group of young professionals began meeting at various happy hours for a design concept (oh, the millennials!). I should perhaps mention now that we did not build a tiny “house”. By the first meeting we knew, logistically speaking, it was not wise to attempt to build a livable space due to material and financial restrictions, time constraints, and actual construction knowledge. The final concept was to design a simple multifunctional space that could be easy to assemble/disassemble. In the end, the design was a simple 7’ x 12’ frame with a shed roof. The structure would consist of nine wall panels and four roof panels that would be connected via a “through-bolt & label system”. Slowly but surely the group encountered challenges. The first was the realization of how few materials we actually had. The grand notion of having enough materials from the canceled RDA event faded when we were presented with a mere handful of plywood sheets. To supplement we were fortunate enough to gather materials from the Houston ReUse Warehouse, which is a place where people can donate un-needed building materials instead of filling the landfills. Other materials were also purchased at a local home improvement store. After we acquired all needed materials we had to figure out how to actually build this thing. Surely a group of young Architects, Engineers, and Urban Planners would be a power house group, right? The reality was that we had two tape measures, a hammer and nails, one table saw and a group of kids with no real construction skills. The first build day was brutal. In the middle of the August heat we continuously moved our building area so that it followed the shade coverage. We were able to complete two wall panels. On the next build day we come up with a system that we would follow on a few more build days that we held once-a-week. After a few weeks of the hammer and nail routine we were finally able to borrow a nail gun which just about saved our fresh arm strength! The nail gun seemed to give all of us the giddy optimism that this could be done! With Park(ing) Day now less than two weeks away we spent every evening after work building under a carport. We knew being newbies meant the craft wasn’t going to be prestige. In fact, many neighborhood walkers asked us if we were building a haunted house for Halloween (how our egos plummeted!). 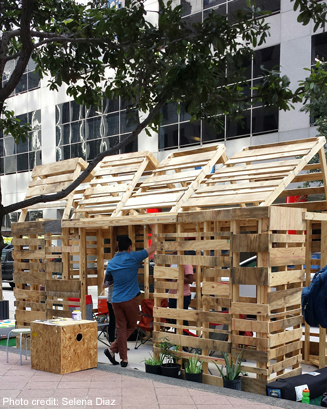 The day before Park(ing) Day our “Tiny House” was complete. As imperfect as it was it was our creation. Looking more like a chicken coop, we knew that even though it wasn’t the prettiest of sites (pun intended), it was made from our hard work and optimism (mostly optimism)! In the end, Park(ing) Day was a complete success. About 11 groups participated as we occupied the corner of Capitol and Travis in downtown Houston. 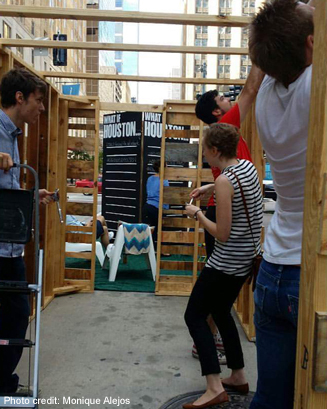 There were parks, games, mini golf, and interactive “What if Houston…” signs that encouraged passersby to think about a better Houston. 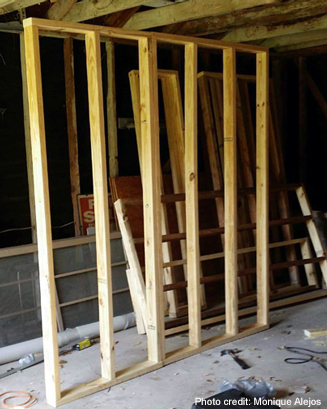 As for our group of what we’ll call “Nice Weirdos”, Tiny House gave us some perspective on the amount of work that goes into creating a structurally-sound aesthetically pleasing space.